Ko te Reo te Mauri o te Mana Maori. The language is the life force of being Maori. as being an official language of New Zealand. The Maori language came to New Zealand with the Polynesian migrations around 1000 years ago. Since then, it has developed independently of other Polynesian tongues to become the Maori of today. 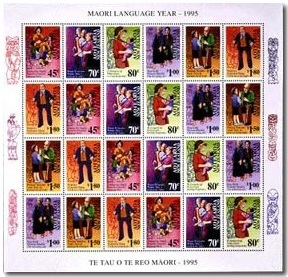 According to a 2001 survey on the health of the Māori language, the number of very fluent adult speakers was about 9% of the Māori population, or approx. 30,000 adults. 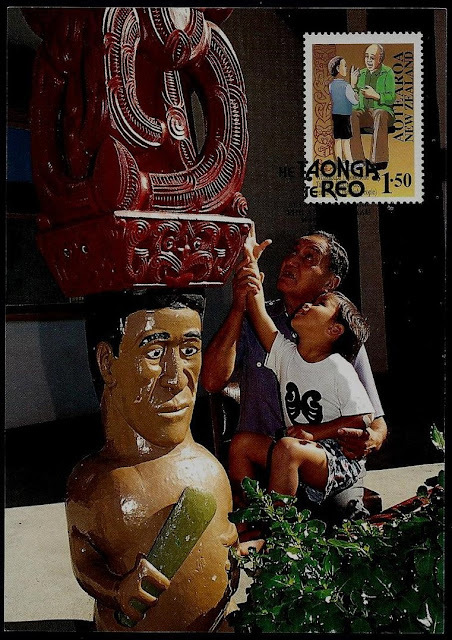 A national census undertaken in 2006 says that about 4% of the New Zealand population, or 23.7% of the Māori population, could hold a conversation in Māori about everyday things. Today that number has continued to grow with 60,000 speakers in 2009 and 150,000 by 2013. 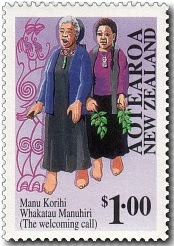 As Maori is not spoken widely anywhere else in the world, it provides New Zealand with a unique language identity. For that reason, and for the important role it has to play as a positive social force in the Maori community, its survival is seen as vital. This was recognised with The Maori Language Act 1987, which declared it to be an official language of New Zealand. Another important step was taken in making 1995 Maori Language Year - Te Tau O Te Reo Maori, which was celebrated with this stamp issue. The English word (name) for this language, comes from the Māori language itself, where it is spelt "Māori". 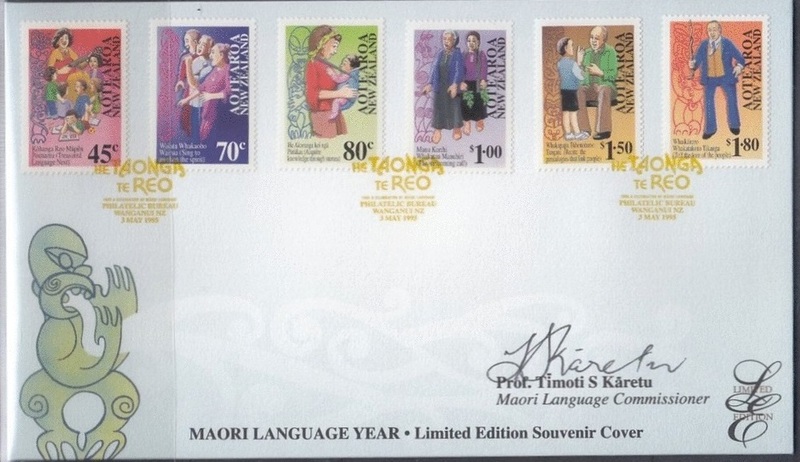 In New Zealand, the Māori language is commonly referred to as Te Reo "the language", short for te reo Māori. The spelling "Maori" (without macron) is standard in English outside New Zealand in both general and linguistic usage. The Māori-language spelling "Māori" (with macron) has become common in New Zealand English in recent years, particularly in Māori-specific cultural contexts, although the traditional English spelling is still prevalent in general media and government use. Preferred and alternate pronunciations in English vary by dictionary, with /ˈmaʊəri/ being most frequent today, and /mɑːˈɒri/, /ˈmɔːri/, and /ˈmɑːri/ also given. 2017 Te Reo Maori - Maori Language. New Zealand has three official languages: English, Māori and New Zealand Sign Language. As mentioned above, Māori gained this status with the passing of the Māori Language Act 1987. 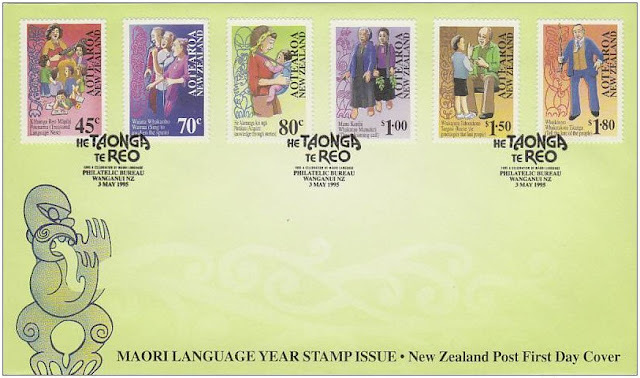 Most government departments and agencies have bilingual names; for example, the Department of Internal Affairs Te Tari Taiwhenua, and places such as local government offices and public libraries display bilingual signs and use bilingual stationery. When ringing a Government department, you are often greeted with a cheerful Kia ora. 45c - Kohanga Reo Mapihi Pounamu (Treasured Language Nest). 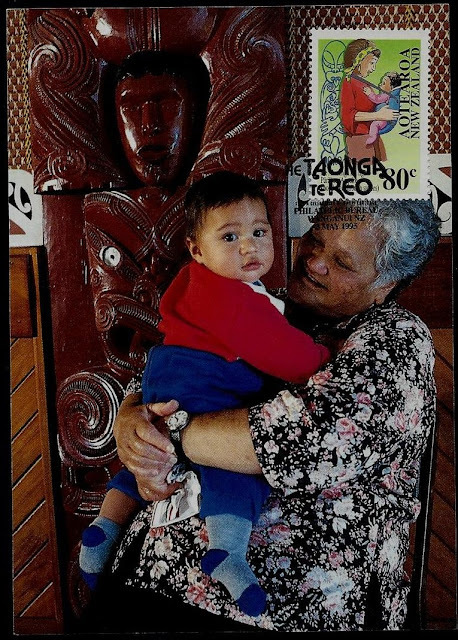 The resurgence of interest in the Maori language is nowhere better illustrated than in the spread of the kohanga reo or language nests. 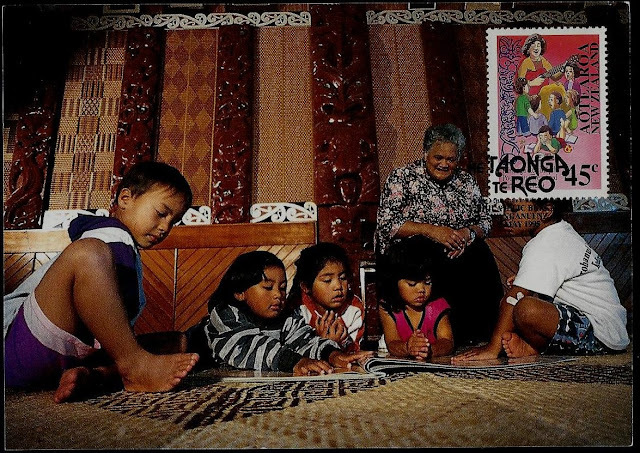 These early childhood education centres use Maori as the sole language of instruction. 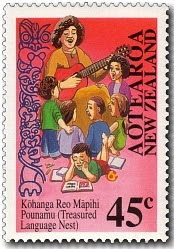 The first kohanga reo was set up in 1981; by the end of 1987, there were 522 established around the country, catering for over 11,000 children. 70c - Waiata Whakaoho Wairua (Sing to Awaken the Spirit). 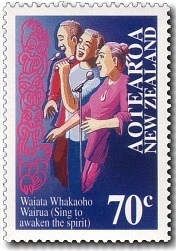 Waiata are the traditional, centuries-old chants that are sung without musical accompaniment. The more tuneful action songs, or Waiata-A-Ringa, are a relatively recent development. The most lyrical Maori action songs - such as Po Karekareana - were written between World War I and II. 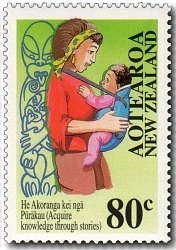 80c - He Akoranga kei nga Purakau (Acquire Knowledge through Stories). He Akoranga kei nga Purakau (Acquire Knowledge through Stories) - In earlier times the Maori language did not exist in any written form. All knowledge was passed from one generation to the next by weaving spoken words to tell and retell myths, legends and tribal stories. (See our index page New Zealand Maori for many of these stories. 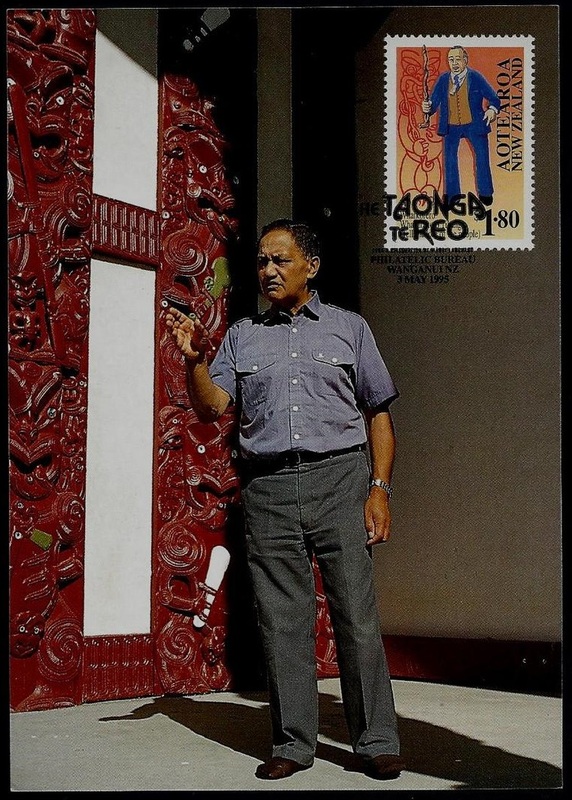 $1.00 - Manu Korihi Whakatau Manuhiri (The Welcoming Call). All the formalities at a marae are carried out in Maori. The welcoming call of the women ritually clears the way for the men to be able to speak. It is, in fact, more than a call; it is that part of the ceremony of welcome which gives the women the opportunity to vent their feelings. 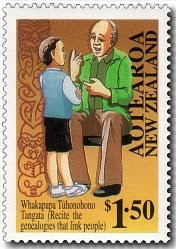 $1.50 - Whakapapa Tuhonohono Tangata (Recite the Genealogies that Link People). The recitation of the family tree, or one's Whakapapa, forms an important part of the Maori oral tradition in passing on information. For every Maori, it provides a crucial source of identity and pride. 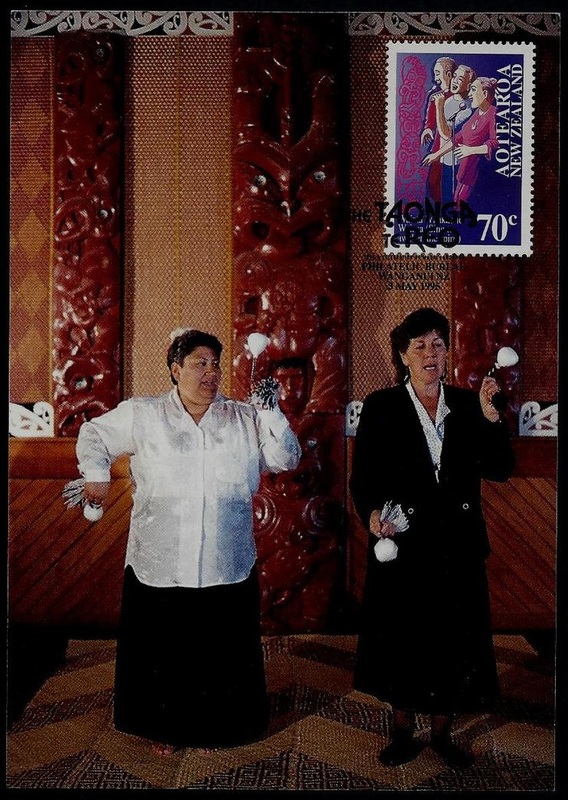 $1.80 - Whaikorero Whakakoto Tikanga (Tell the Lore of the People). Whaikorero is the art of formal speech-making that is made on the marae. This oratory is rich in imagery, subtlety and linguistic nuances. It requires a great knowledge of tribal history, proverbs and mythology and is a skill that takes years to master. First Day Cover - 3 May 1995. Limited Edition Sheet & Cover. Limited Edition Souvenir First Day Cover. This product was produced for inclusion in a special Limited Edition Collectors Pack, the sheet incorporated four strips of the six stamps and included a decorative border. 1995 Maori Language Maxi Cards. 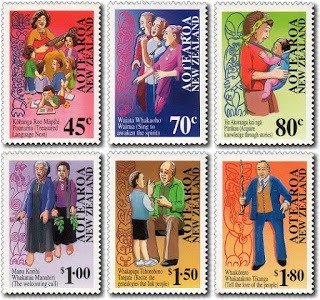 Six photos illustrating the subjects shown on each stamp. While these photos appear to have been posed, all taken in the same location, they are still worthy of including in this post. Oh what wonderful photographs. The stamps are good too. te reo Maori is important to my people's cultural heritage. I am pleased to see it featured in stamps but more important to me is to see it in your blog. 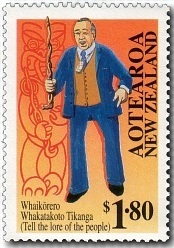 Kia ora Allan. Well done. 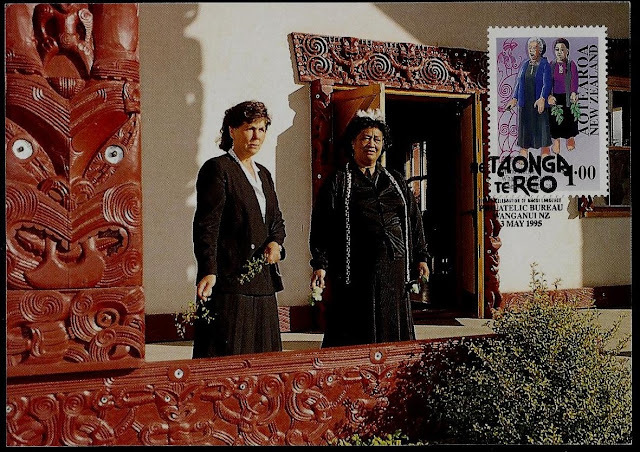 Not as good as some Maori pages you have done Allan, but an interesting subject and like Moa said above, good photographs representing each stamp. Like your opening "The Language is the Life Force of being Maori." I also like the beautiful Maxi Cards. They look great! Yes I agree with you on both of those. That made a good opening into a post on Maori language. The cars were a real find too. One of the other writers found them and gave them to me for this post.